To clean and cook small sea snails, boil for approximately 25 minutes in a pot of salted water. This will remove the sand and grit trapped inside the shell and cook the snail meat. 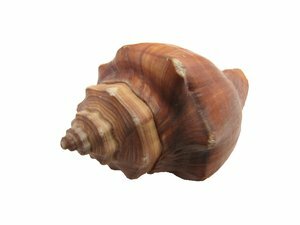 For large snails like Conch and Whelk, I suggest you cook them either very quickly or not at all, or cook them for a very long time to achieve a tender snail, you can also save time and gas by cooking them in a pressure cooker. In order to remove the Sea snail from it's shell, use a thick sharp pin to spear and pull out the cooked snail. Remember to remove the operculum. Periwinkles are often eaten whole, but you can remove the dark squishy areas if you prefer. A toothpick can also be used to remove the snail from it's shell. When preparing shelled snails, wash shelled meat carefully to avoid any grit getting into your dish. In a saucepan, heat up olive oil and sauté garlic and chilli peppers. Add snails and wine and cook for a few minutes. Add salt, parsley and toss together well. Limpets are marine snails with a flattened conical shell. To grill them, just arrange the Limpets shell side down on a hot grill and top with chopped shallots and your favorite flavored butter or oil.